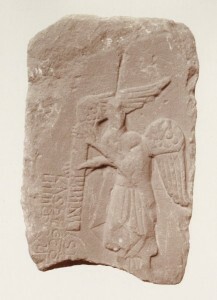 Hidden within the present day Cathedral is the angel stone recovered during the Victorian renovation, embedded in the wall of the original South Porch. Made from Collyhurst stone it has been dated to around 700 AD and has given rise to much speculation about its meaning. 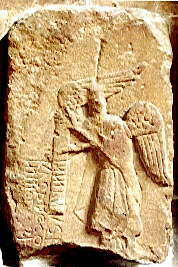 You can still see it today, around thirteen inches high by eight wide, it represents an angel with extended wings holding a scroll on which there is an incised inscription. The scroll being too small for the words, the lettering is continued in two lines cut into the plain surface. It is unlikely that we will ever know the truth behind the fragment of sculpture but whether it is sepulchral monument, a dedication stone to St. Michael, a memorial of some unknown saint or martyr, or a fragment of a representation of the Annunciation or of the Crucifixion, it is undoubtedly Manchester’s only example of Saxon art of more than a thousand years ago as well as proof that Christianity was practised on the banks of the Irwell prior to the Norman Conquest. The stone would gain further fame in the twentieth century, first as having the distinction of being the first halftone photograph to appear in the Manchester Guardian, printed in 1905 based on a photo taken by a Mr William Ellis from Longsight. The paper, unlike its rivals, had been slow to embrace the new medium in print only employing its first staff photographer Walter Doughty three years after the image appeared. 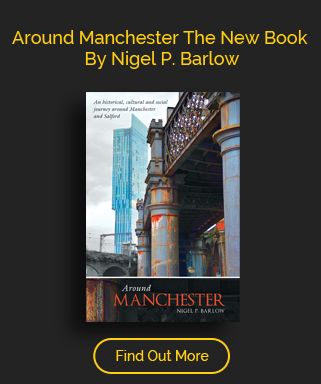 It was also to be given star billing in a novel by the writer Livi Michael linking its story and that of Medieval Manchester to the modern city centre in an historical horror fantasy for teenagers set in 1604 and including the mysterious John Dee and the ghost of his collaborator Edward Kelly.